[AUTO](VC/RC):When placed, COST [Counter Blast (1) & Soul Blast (1)], choose one of your opponent’s rear-guards, retire it, and if this unit is on your (VC), draw a card. 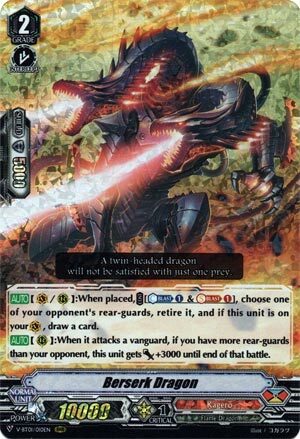 [AUTO](RC):When it attacks a vanguard, if you have more rear-guards than your opponent, this unit gets [Power]+3000 until end of that battle. AKA the perfect Grade 2 ride for Kagero. I mean CB1 and SB1 for an unconditional retire is sweet already if a bit pricey, but as a VG it’s a straight +2 to you in advantage. As far as using it as a RG is concerned, you’ll need to be a bit more selective as Overlord needs the soul more than Berserk does. Unless you desperately need to kill a G2 or G3 causing problems, back-row sniping, I maintain, is worth more, and that can be picked up by Nehalem. Second skill is largely so you can combine with Aermo (or Gojo if you tech it like I do) so it can make 24k and thus have 5k shield left over in case of damage trigger screw. But being able to swing at any VG unboosted is pretty sweet too.